When times are tough, how many times have you turned on some music or picked up a good book? And didn't you feel better afterwards? We all know the healing power of the arts on an individual level. At WomenArts, we constantly see that healing power on a global level. We get letters from women artists all over the world who we will probably never meet, and yet we feel deeply connected by experiencing their art. Eleven years ago we created Support Women Artists Now Day/SWAN Day to capture some of that energy. Our goals were to celebrate the full power and diversity of women's creativity, and to unite women artists around the world. With the help of thousands of women artists in 36 countries, this grassroots effort has succeeded beyond our wildest dreams. In these troubled times, SWAN Day is more important than ever because it reminds us of a world that the mainstream media ignores - a world of women artists who continue to dream and create in spite of all the obstacles. These women give us hope. When we don't know what news to believe, women artists put us in touch with our emotional truths. When we get discouraged about the state of the world, women artists help us imagine something better. We must make sure their voices are heard! We know that the economy is challenging for many of you. If that is your situation, please know that we are rooting for you, and we hope that you can find the strength to keep doing your art. If you are able to celebrate Giving Tuesday today, please help us show the world the power of women's creativity. 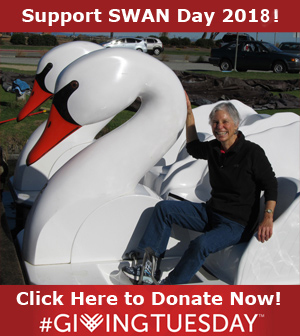 Make a gift to WomenArts and help us make SWAN Day 11 the best one yet!